A: To learn more about DignityFirst Health at Home, call us at 720-274-9600 to tell us about your situation and the type of services you need. Q: What if my mother or father says they don’t need any help? A: With the DignityFirst professional Geriatric Care Managers, we have the expertise and experience to work with seniors and families to find the best options for all involved. Q: What makes DignityFirst Health at Home different from other at-home care companies? A: DignityFirst services are distinguished by our highly trained and qualified Caregivers that are supervised by our Care Managers. 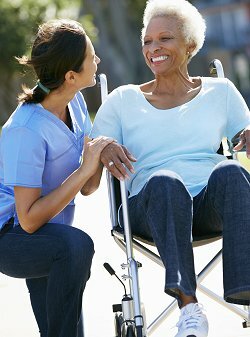 Our customized care plans for each client are very useful in providing day-to-day and long term care goals. Our electronic family portal allows for great communication between families and our care managers. A: Our rates and service hours vary depending on the services you need. Please call or fill out the online form and describe the type of in home care services you need. We can then provide an estimate on hours needed and cost. A: Most long-term care insurance policies cover in home care services while Medicare does not provide for long term in home care. A: Our Caregivers are thoroughly trained through our rigorous DignityFirst Health at Home training program and all of our Caregivers are supervised by a DignityFirst Geriatric Care Manager. We conduct detailed national background checks and drug testing on all of our employees. DignityFirst Health at Home is fully bonded and has workers’ compensation coverage. A: At DignityFirst we strive to offer continuity in our Caregiver placements. We make every effort to provide the same Caregiver as much of the time as possible. A: DignityFirst pays the Caregiver directly. DignityFirst Health at Home is fully bonded and has workers’ compensation coverage.